(Host) Governor Peter Shumlin has promised to bring state workers back to Waterbury, a town devastated by Tropical Storm Irene. Shumlin’s pledge to support Waterbury cheered residents who have weathered an economic storm since the flood closed the state office complex. VPR’s John Dillon reports from Waterbury’s town meeting. (Dillon) In the hallway of the Thatcher Brook primary school, resident Mary Miller set up large poster boards for the Town Meeting Day crowd showing various options for Waterbury’s future. Miller is active in the group Revitalizing Waterbury. She’s part of a community-wide planning process that’s focused on issues such as affordable housing and economic development post-Irene. (Miller) "It’s been an interesting process because in the back of everybody’s mind is we have lost 1,500 employees downtown: what’s the impact, what are our next steps? And this is an effort to say there may be some opportunities here after the flood." (Dillon) Just then the official who will determine the fate of those 1,500 employees – and to some degree Waterbury’s economic future – stepped into the school as part of a town meeting day tour. (Miller) "Governor! How nice to see you!" (Shumlin) "You’re doing a great job, you’re the rock." (Dillon) Governor Peter Shumlin has had a somewhat rocky relationship with Waterbury, a town hard hit by last August’s storm. 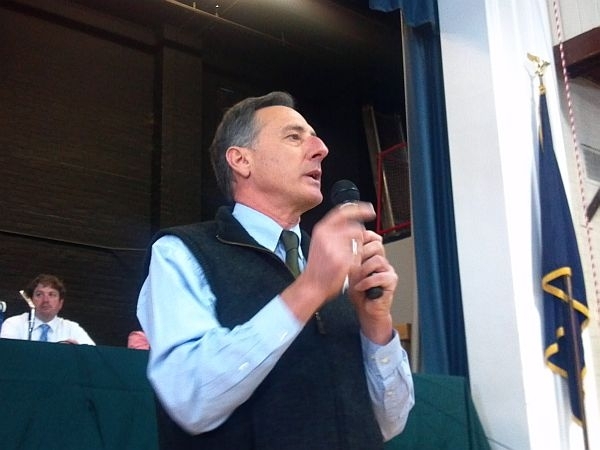 After the swollen Winooski River damaged buildings and forced the state office complex to close, Shumlin was criticized for not immediately promising to bring the workers back. Six months after the storm, the governor spoke through a bad P-A system and delivered a more definitive message. (Shumlin) "When it comes to the state office complex I believe that the best solution would be to get back to Waterbury as quickly as we can. That’s our first and top choice." (Dillon) But the governor said the details and the timing will have to wait until his administration reviews the options presented in an architect’s report due at the end of this week. (Shumlin) "Some people feel frustrated that we haven’t already moved back into the Waterbury complex. I just want to mention a couple of quick points of why we haven’t. No matter what we do, the heating system, the heating plant has to move. It’s tough to work in a building without any heat." (Dillon) The governor said some buildings in the historic complex will have to be torn down, while others will be refurbished. Steven Konkol is a local contractor who’s been rebuilding homes in Waterbury. He liked the governor’s promise, but he wants Shumlin to speed things up. (Konkol) "When it came to re-building the roads they just did it. When it’s coming to rebuilding this thing they’re just going through channels. I think he will bring back a majority of the folks that left." (Dillon) The governor’s appearance was not the most controversial item at Waterbury’s town meeting. The real debate came over a move to expand the village police force to the entire town. Voters overwhelmingly rejected that plan. For VPR News, I’m John Dillon in Waterbury.